I love this idea. Basically, you pick 5 books and read them all everyday for a week. When I was working, I used to read 3 books a day to the kids (I was working with 1-2 year olds). We would read 1 book everyday for the week and 2 books each day would be different. It worked so well, and we got to the point where some of the kids approaching 2 would be able to "read" the book from memory. It developed language skills as well as attention span. I started reading to R when he was about 2 weeks old, and started with M when he was about 6 weeks old (have been a bit slacker with M, but there is just not enough hours in the day sometimes!). I was really keen to make sure my children loved books. My mum is a librarian, and passed on her love of books to me, and I want to pass it on to my boys. Plus I also read somewhere that children who love books and enjoy reading are better students. 4. Five Little Ducks Went Out One Day! by Margaret Bateson-Hill. 5. Donald Loves Drumming by Nick Bland. 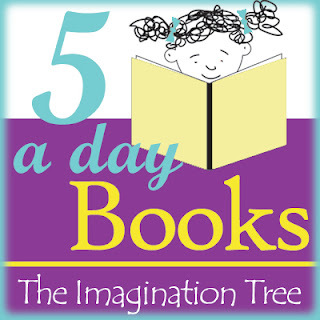 Linking up to The Imagination Tree. Yay! Thanks for joining in and glad to know you already did something similar! Isn't it amazing the impact it can have just repeating the same books over and again? My 2 year old has memorised many books by heart now by following this each week! Love "One Duck Stuck" too- perfect rhyming book.